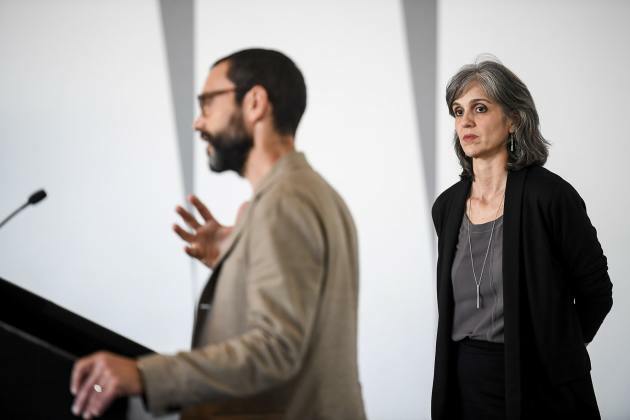 Olga Viso may have stepped down as executive director of Walker Art Center, but in a new opinion piece for the New York Times, she's stepping into a heated national debate. Under the headline “Decolonizing the Art Museum: The Next Wave,” Viso addresses what she calls "an urgent question: How do museums reconceive their missions at a time of great societal reckoning around race and gender, and as more diverse audiences demand a voice and a sense of accountability?" Her assessment is grim: "There are now two incompatible art worlds: one committed to inclusion, artistic freedom and change, the other driven by money and entitlements. When agendas collide, there are casualties." She discusses her own background as a Cuban-American during the 1980s, a time of institutional critique, and notes that the struggle to redefine museums has come full circle for her: "In my first curatorial jobs, I fought along with others to present art that exposed the underlying power structures of white establishment culture, corporate America and the federal government. But these efforts failed to effect lasting change." While museums have diversified their programming and artists of color have found new opportunities, she doesn't view the commodification of art as the answer. “The surging commercial art market has become another colonizing force," Viso says. She draws a lesson from her own experience a year ago with Sam Durant’s "Scaffold," a sculpture that replicated eight gallows from U.S. state-sanctioned executions, including the hanging of 38 Dakota warriors in Mankato, Minn. Intended as a critique of capital punishment, it instead triggered anguish and anger from the Native American community and was dismantled in a Dakota-led ceremony. 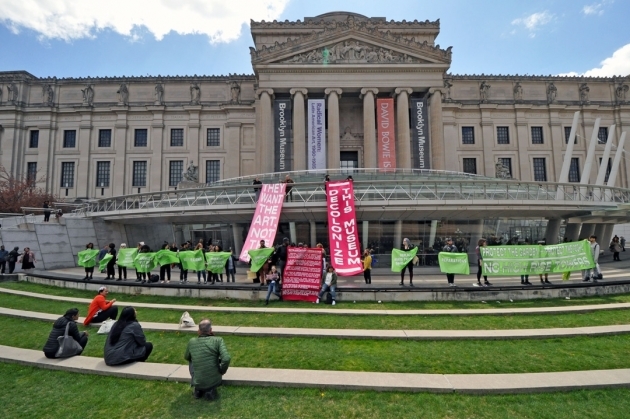 Viso's piece is timely, in light of ongoing protests at the Brooklyn Museum in New York (photo at right). Demonstrators occupied the museum's atrium Sunday, demanding truly radical change. They reiterated demands for a decolonization commission after the museum's hiring of a white woman as curator of African art, asked for a "‘deep diversification’ of museum staff, the removal of the museum's board president (who is connected to various real estate interests), a commitment from the museum to mitigate gentrification, and an acknowledgement of the full history of the museum’s holdings along with the fact that the institution was built on indigenous land." The Walker has faced similar demands. In Canada, the Banff Contemporary Art Center acknowledges at every opening the fact that it is on Native land. That issue is likely to arise again at the Walker Thursday evening, when four artists of color (African-American and Native American) -- Jovan Speller, Dyani White Hawk, Alanna Morris-Van Tassel and Rosy Simas -- stage a multidisciplinary program called "Choosing Home: A Right, a Privilege, or an Act of Trespass." Just a few months ago, Durant spoke at the College Art Association conference in Los Angeles, pointing to the need for a “truth and reconciliation” process in the United States. Since Viso's departure, the Walker has continued discussions with the Native community. A public panel in March pointed to the hiring Native staff and exhibiting work by Native artists as two steps toward better engaging that community, along with regular dialogue -- and not only in times of crisis. "We're often only called in when it's a Native question," said Candice Hopkins, a curator/writer from Canada who is a member of the Carcross/Tagish First Nation. "We need to be brought in for many questions."